There will be no KPL matches this weekend as the National team prepare for a World Cup qualifier against Nigeria’s Super Eagles to be played at the Moi International Sports Centre, Kasarani, on Wednesday. But as the league takes a break, the coach left for Croatia last evening unsure about his return. “I have to go since I need time to relax and stay away from football,” said Zdravko, as he was preparing to take his flight back to Croatia, stating that he doesn’t know when he’ll come back. A section of Gor fans and officials alike have expressed their unhappiness with the Croat’s tactics and approach to matches. The club just got bundled out of the prestigious KPL TOP 8 Tournament, in which they were the defending champions after failing to make a mark in the continental tourney. However, the recent loss away to Western Stima at Mumias Sugar Sports Complex seems to have rubbed some officials the wrong way and a section of Gor’s loyal and active fans who have previously questioned the coach’s pay are now pushing for explanation or action to be taken against the Croat. They are saying that the coach isn’t giving them value for money. “Zdravko is earning too much yet the team is not winning. Instead, the boys display a lackluster performance, unlike the previous beautiful game attributed to Gor,” said Osewe Kaluoch, who is the Secretary of Gor’s Away Branch. Last Tuesday, the club’s technical Committee was locked up in a closed-door meeting in what FeverPitch can now reveal was an emergency meeting called to discuss the team’s latest string of poor results. In a meeting chaired by the Club’s treasurer Samuel Ominde, questions were raised on the whereabouts of senior vice chairman, David Kilo, who led the delegation to Mumias. Apparently, some of the committee members felt that the players could have done better than letting go all the three points. “Preparing a team for a match is not a walk in the park. As such, we are upset with the latest string of poor results. I am keenly following all the leads just to unearth the cause of poor results,” said Bwana. Gor Mahia members are set to conduct their club elections at the end of this year. The tell-tale signs of the usual mudslinging and blame games within the club’s top decision-making organ are quite clear. One of the club officials, who isn’t allowed to speak on behalf of the club, told FeverPitch that some of the club officials have started aligning themselves in preparation for November polls and, in turn, such developments hamper the team’s preparations for matches. The match between Gor Mahia and Tusker that was scheduled for May 30 has been pushed off to a date to be announced later. The reason for the postponement was to allow enough time for the national team to prepare for their crucial encounter with the Super Eagles of Nigeria. The postponement is a reprieve for Gor Mahia who have been ravaged by injuries of late. Raphael Kiongera, Anthony Gathu and Innocent Mutiso are still nursing long term injuries. Strikers Rama Salim and Dan Sserunkuma have nagging injuries , while dependable midfielder Moses Odhiambo also picked up a knock on Sunday against Western Stima. Aside from recovering from injuries, the postponement also gives Logarusic and the rest of the technical bench more time to work on the issues plaguing the team. Meanwhile Jerim Onyango, Musa Mohammed, Edwin Lavatsa and David Owino have joined the national team camp while defender Israel Emuge has been called up the Uganda national team. Troubled Tusker midfielder Peter Opiyo is headed back to his former club Gor Mahia after failing to nail a starting role at the league champions. Tusker coach Robert Matano has exclusively revealed to Goal.com that talks have began between the brewers and Gor Mahia after the player asked to leave in the June transfer window. There has been reports of a frosty relationship between Matano and the player, who has not played for close to two months. When reached for comment, Gor Mahia Secretary General George Bwana confirmed there are talks to bring back Opiyo but insisted they are still in the initial stages and no decision has been made yet. “We have had a lot of problems in this department which we are keen to rectify in the second leg,” added the official. Opiyo played for Gor Mahia in the 2010 season when the team finished runners-up in the premiership race to eventual winners Ulinzi Stars. Apart from Gor, he has also played for Thika United in the local league and was at one time in the national team Harambee Stars. The fans were on their way to Nairobi from Mumias Sports Complex after watching their team lose 2-1 to Western Stima in a Kenyan Premier League match on Sunday. The thugs waved down the driver of the Mitsubishi vehicle registration Number KBV 062A at 2am and ordered him out of the vehicle and hand over the ignition keys to them. The thugs were fully dressed in police uniforms and were armed with rifles according to victims interviewed at Molo Police Station where the bus was stationed after the ordeal. Sensing danger, the bus driver released the ignition keys to one of the thugs who commandeered it to a nearby bush where they found an earlier carjacked Mololine Matatu registration Number KBF 130S. The Gor Mahia fans refused to let in the thugs through the main door forcing them to break four windows using the gun butts. The thugs then ransacked all the fans and stole their valuables, which included money, mobiles phones and other personal effects. The bus driver Charles Njuguna said he heard one of the thugs speak in Dholuo to sensitise the fans of the danger if they resisted while the other three were conversing in a different language. “They told us to obey their orders if we wanted to be safe,” a shaken driver who was bare feet after he lost his shoes and Sh25,000 to the thugs. While in the forest, one of the thugs raped a twenty-year-old lady who was a passenger in the Mololine Nissan, which was travelling from Eldoret to Nakuru. She was later admitted at the Molo District Hospital where doctors said she was in a stable condition. “The patient is okay although she is a bit shocked from the inhumane act. She has received medication and is responding to treatment well,” said one of the doctors attending to the lady. Molo OCPD Job Lesikinwa confirmed the incident and said they were following crucial leads. i“We are tracking them down and will arrest them soon,” he said. He called on motorists to ignore any road block at night which is manned by people purporting to be police officers without a police vehicle. The Nissan Matatu driver John Kamau said they were carjacked at midnight by thugs who wore police uniforms and were all armed with rifles. One of the passengers in the matatu Isaac Simiyu said he lost Sh3,000, shoes and documents which included two ATM cards and his national Identification card. Nakuru County Governor Kinuthia Mbugua who toured Molo on Monday with his cabinet decried the rising insecurity in the area. He said he would push for the transfer of all police officers who had over stayed in the area. Western Stima beat Gor Mahia 2-1 in a Tusker Premier League match played at the Mumias Sports Complex on Sunday 26 May. Gor Mahia showed intent early in the match, Dan Ssrenkuma hitting the bar in the third minute with a left-foot volley after a neat pass from David Owino. David Owino headed in a Moses Odhiambo cross a minute later but the goal was disallowed. The hardworking Harambee Stars defender’s effort paid off when he rose high to head in Moses Odhiambo’s free kick in the 14th minute. Western Stima equalised two minutes later after Jerim Onyango punched Hedmond Mauda’s cross into his own net. Wesley Kemboi made matters 2-1 pouncing on a loose ball after a Musa Mohammed and Ivan Anguyo hesitated in clearing a ball in the box. Gor’s Kevin Ade Omondi almost equalised in the 44th minute but his shot went inches wide after an inviting pass from Musa Mohammed. Gor made an immediate change in the second half bringing in Anthony Akumu for Moses Njunguna. Dan Sserenkuma found Rama Salim with a good pass but the latter hesitated while in a good position to shoot and the ball was picked by Western Stima custodian Ben Roberts. Rama Salim tapped in to score in the 53rd minute after another good pass from Dan Sserenkuma but the goal was ruled out to be offside. Anthony Akumu sustained an injury in the 64th minute and was replaced by Moses Otieno. The former Kakamega High School made an immediate impact as his hard shot from outside the box went just inches over the bar. Gor Mahia’s best chance came in the 81st minute after Western Stima’s George Wesa handled the ball just outside the box. Kevin Omondi’s resultant free kick hit the side bar, match ending 2-1 in favour of the homeside. Harambee Stars preparations for their 2014 World Cup qualifiers second leg match against Nigeria in Nairobi on June 5 has been jolted by a simmering stand-off between national team coach Adel Amrouche and his Gor Mahia counterpart Zdravko Logarusic. On Tuesday, Logarusic incensed Amrouche by withdrawing Gor players from the Stars camp despite an agreement that the players would stay on until last evening. Logarusic recalled Rama Salim, Edwin Lavatsa, David Owino and Jeremy Onyango to play in their KPL Top Eight second leg semis match against Tusker on Wednesday. Football Kenya Federation’s liaison officer, John Kariuki, had earlier stated that the federation had agreed with affected clubs that players selected to the national team would not go back to their clubs until Thursday after their May 21-23 training programme with Stars. 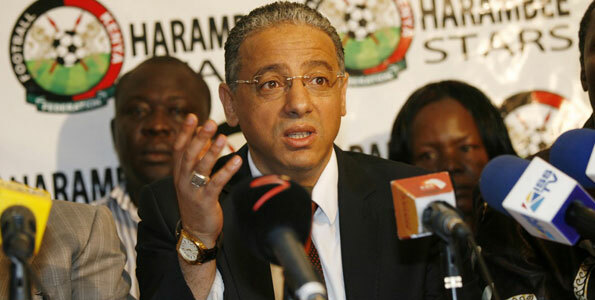 Amrouche has accused Logarusic of undermining the national team. “We only get this problem when dealing with Gor. It also happened before we played Nigeria in the first leg. And now, Logarusic is at it,” Amrouche said. But Logarusic has downplayed the stand-off, saying he was only taking care of his priorities. “I also want the national team to do well, but my club has congested fixtures. My best players should not be away, especially when they are not playing any game,” Logarusic said. Ivo Philip Mapunda is an experienced goalkeeper who has played in three countries and has played for the Tanzanian national team. Mapunda is famous for his penalty saving exploits and the white towel that he keeps in his goal area. His post match celebrations are equally memorable. Despite his heavy set physique, he does tumbles and somersaults with the agility of an Olympic gymnast. His greatest achievement came in 2012 when he saved two penalties against Sofapaka in the 2012 FKF cup final to enable Gor Mahia to lifyt the cup and thus qualify for the 2013 CAF Confederations cup. He repeated the same heroics when he foiled Tusker in the 2013 Supercup. Aside from his penalty saving exploits, Mapunda is rock solid between the sticks. He is very dependable with high balls thanks to his leaping ability. Mapunda is highly experienced, having played for Yanga, African Lyon , St George (Ethiopia) and Bandari before joining Gor Mahia. In the 2013 CECAFA cup, Mapunda was called up to the Tanzania mainland national team. After a stellar display, he was lured by Simba SC of Dar es Salaam. Tusker FC advanced to their first ever Top 8 final courtesy of a 1 – 0 aggregate win over Gor Mahia after managing a 0 – 0 draw in the second leg of the semi final clash staged at the Nyayo National Stadium on Wednesday 22 May. The league champions started on a front foot with Robert Omunuk catching Ivan Anguyo’s outstretched arm with a cross but the brewers calls for a spot kick were waved away, only for a corner to be awarded. The corner in the first minute was curling in until Ivo Mapunda intervened to punch out for a second corner in two minutes. The corner was cleared as well before Gor managed to settle a bit in the game but Tusker continued pushing with no success in the final third. Gor had the first chance in the tenth minute when Musa Mohamed raced well on the left flank to cross in for Edwin Lavatsa but his ball was closer to Samuel Odhiambo than the Harambee Stars forward. With Tusker clearly the dominant side in the midfield battles reckless tackles started flying in from the Gor Mahia players and in the 26th minute the referee flashed out the first yellow card, to Gor’s stand in captain Donald Mosoti for a poor tackle on Ismail Dunga. Two minutes later Khalid Aucho was booked for diving in a quest to win a penalty under pressure from David Otieno. Mosoti should have been given his marching orders on the 35th minute with a tackle from behind on Jesse Were but the referee passed the chance and seven minutes later the defender hacked down Dunga again. Instead it was his team mate David Otieno who was cautioned for a foul on Justin Monda as the teams headed to the break. Gor Mahia introduced Dan Ssreunkuma at the start of the the second half and Moses Odhiambo later on but their attacking groove came in the 70th minute when Odhiambo forced the Tusker keeper into a great save to tip over a long dipping attempt for a corner. Rama Salim had a goal bound header cleared with the keeper already beaten five minutes later then in the 82nd minute had another header crashing off the bar. As Gor went in hunt of the all important goal, they were caught on the counter in the 92nd minute forcing Ivo Mapunda into a triple save to keep them in the game but all that was in vain as Tusker managed to hold on for a place in the final where they will take on Thika United. Gor Mahia will take on Tusker on Wedensday in a decisive KPL Top 8 semi final. Tusker won the first leg 1-0 The aggregate winner of the two legs will go to the final to take on Thika United who beat Chemelil Sugar to advance to the final. Strikers Dan Sserunkuma and Rama Salim are both facing late fitness tests according to the Daily Nation. However Logarusic might be wise to leave the duo out altogether and let them focus on league matches. In their absence, Gor Mahia can play Abbey Natty Kunrumi and improvise with another striker. Kevin Omondi is out with malaria. Also out is David Owino, Israel Emuge and Anthony Akumu who of late has been out of form. Perhaps some rest will do him good. Seldom used players like Yusuf Juma and David Otieno should be given a chance to prove their worth. We will pay to win, but I am predicting a very tough match,” Logarusic told the Nation. Tusker have struggled of late having lost two matches on the trot and their are rumours of a player revolt because of coach Robert Matano’s high handedness. Gor Mahia will be looking to defend the cup they won least seaosn while Tusker are looking for their first ever Top 8 win. On Saturday 18 May 2013, several Gor Mahia fans were attacked on their way to town around the Muthurwa Market soon after a tie between K’ogalo and Nairobi City Stars at the City Stadium that ended 0-0. As the story goes, an initial set of fans provoked hawkers around the market who then ganged up and attacked other fans streaking from the City Stadium into town, the targeted being those with Gor Mahia jerseys. After the incidents, Gor Mahia Secretary General George Bwana commented on the unfortunate acts soon after the Club’s Vice Chair Faiz Ochieng released a statement on the same. Keen Gor Mahia followers, through comments after Bwana and Ochieng’s respective postings, have accused both officials of being in denial that some of their fans are indeed hooligans and looters and their acts on Saturday being the root cause of the Muthurwa chaos. Bwana still stands his ground on his comments and from his own analysis reiterates that some criminals purport to be Gor Mahia fans, branded in the team jerseys, and is calling on the Police to arrest them with immediacy when they cause such chaos. During the Muthurwa fracas on Saturday, Gor Mahia’s team bus was stoned, but as confirmed by Bwana earlier, all the five players on board escaped unhurt.